Jeff Jarvis has a posting "What makes America exceptional?". I challenged some of his claims in the comments (which didn't go down too well with some of the commenters, but that's another story). And Andrea put out a challenge to non-Americans to write what's great about their countries. Now I consider myself as European, although I'm German by birth and passport. But then I've lived and still live in the UK for most of my working life (working for an American company ;-)) and visited quite a few European countries (much less than I would have liked though). I also firmly believe in the European idea and hope it will continue to progress as well as evolve. Europe has a long and fascinating history. Not always nice, not always good, but nevertheless fascinating. Sometimes bloody and deadly, but also at other times peaceful (yes, I'm thinking of a particular country here). Europe (well, England) invented football, the most popular sport in the world. And the best football is still played in Europe. Not necessarily by Europeans, but who cares? Europe has variety. A multitude of countries, cultures, languages old and young. Travel a hundred miles/kilometres and frequently you will be in a different country with a different culture and different language. And even if you haven't left the country you are like to notice a difference. Europe has fascinating architecture from various centuries. Greek, Roman, Medieval, Modern, you name it, you'll find it. Europe has great music. Starting with classical music (Beethoven, Mozart, Mahler, Schubert, all the Russians). Then over to rock'n'roll and pop: Arguably two of the best bands ever are from Europe: The Beatles and The Rolling Stones. Europe is humble, sometimes may be too humble. Europe has achieved and is achieving so much, but unfortunately nobody is talking about it. Europe has entrepreneurs and technologists which don't need to hide. Even though they are, but then they are Hidden Champions. And if they are not hidden they are not to be ignored either: SAP, Nokia, Airbus anyone? Europe has great food and drink. French cuisine is famous worldwide, as is Scotch whisky. Pizza and pasta not to be forgotten, the various wines from all over Europe neither. German and Czech beers count among the best in the world. So, fellow Europeans (including non-Europeans living in Europe), what do you like about Europe? Let's stop whingeing for a moment (we all know that a lot of things need improving) and think about why we like Europe and why we're glad to live here. 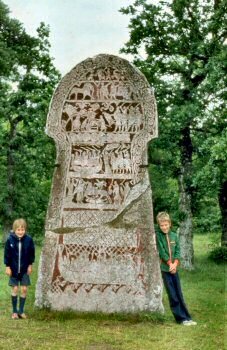 Some European variety: A very old rune stone in Sweden with two young children. One of them conceived in Sweden, the other in the Netherlands. Both born in Germany. One now living in the UK. Not that you wanted to know that, but I'll post it anyway.